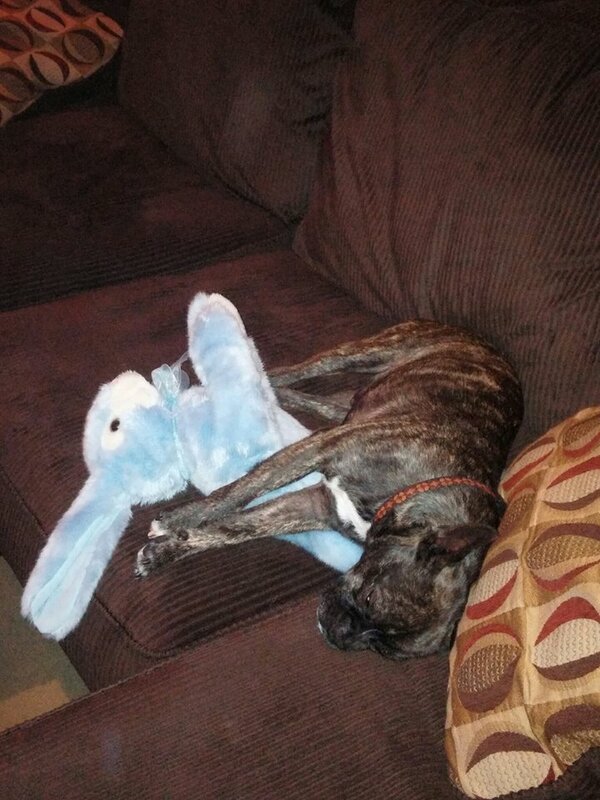 This is Oswald, tuckered out after a long day, sleeping with his favorite blue bunny. We got Oswald from a rescue group that pulled him from a very high kill shelter in the Central Valley of California. He was found on the streets, very thin and sickly, developed Giardia and kennel cough in the shelter, had a prolapsed eye, was depressed, and ultimately put on the kill list. In years past, Oswald would have been killed. This particular shelter had a policy of refusing to work with rescue groups. No animals scheduled to be killed ever went to rescue. But in California, we succeeded in passing legislation to make that illegal. Shelters are not permitted to kill animals if rescue groups are willing to save them. Today, that shelter transfers about 4,000 animals a year and altogether, an additional 46,000 animals are finding homes statewide who shelters would have killed in years past. Though Oswald was withdrawn and sick, he was pulled by rescue and patched together. When we adopted him, the rescue group told us that he is very friendly, will love us immensely, but that he had lost his sparkle. For the first couple of weeks in our home, Oswald was indeed very friendly, but sometimes leery. He would shrink a bit on approach. He was afraid to walk at night. Every little noise scared him. A trip in the car sometimes made him nervous. If you left the room, he left the room as he did not like to be left alone. Today, Oswald is a confident, good natured, wild little guy. A drive in the car is as exciting as a walk at night. He loves staring at deer and squirrels and meeting other dogs. His days include walking 3 miles, playing with his blue bunny (which he carries in his mouth even though it is bigger than he is), trying to get our cat, Kenny, to roughhouse with him, running around with two big kids (my wife and I) and two real kids (my daughter and son), zooming around the house from room to room, playing at the park, an afternoon nap by himself in the downstairs bedroom, being genuinely excited to meet anybody and everybody, even the vet, and then, around 9 pm, passing out from exhaustion. And when he passes out, little can wake him. He is like a wet noodle. You can turn him upside down, you can mold him into shapes like clay, and you can carry him like a baby. He feels safe. He feels happy. He feels home. Oswald has found his sparkle. Rescue groups save roughly 60,000 animals from California shelters every year. Before the rescue rights law went into effect, it was only 12,000. In other states, too many rescue groups report being turned away by their local shelter and then the shelter killing the very animals they offer to save. You can help save animals like Oswald by making that illegal. For a guide on how to get legislation introduced and passed, click here. No Kill Advocacy Center attorneys stand ready to help, click here.